Our crack team of Data Scientists spent the last few weeks pouring over billions of bits of data in search of the secrets behind Santa Enterprises. For those of you unfamiliar with this International monopoly, Santa Enterprises delivers gifts to children around the world each year on December 25th. Their sole representative and company CEO is a man called Santa Claus. This mysterious figure breaks into homes, apartments, condos, huts, shacks, and every other type of dwelling you can imagine, to hand-deliver these gifts based on an enigmatic “list” that he maintains from his company’s HQ located at the North Pole. If you are unfamiliar with this activity it might strike you as strange, but for the vast majority of people this is considered normal. Even something to look forward to. We decided to open the dataVault and dig deeper into the company and the CEO using Webbula insightData. insightData is a powerful tool that can help marketers and advertisers learn more about their customers, so it was only natural for us to see what it could reveal about this yearly event. As you can see from the Infographic above, we managed to learn quite a bit about Mr. Claus and his operations. Santa Enterprises operates under United Nations charter protection, a rare case of universal agreement among the nations of the world, an agreement grandfathered in from previous agreements with the League of Nations. Most importantly this kind of insight is a perfect example of the power of Webbula insightData. A powerful marketing tool that can help illuminate information about your own customers, what they like, where they live, and much more. 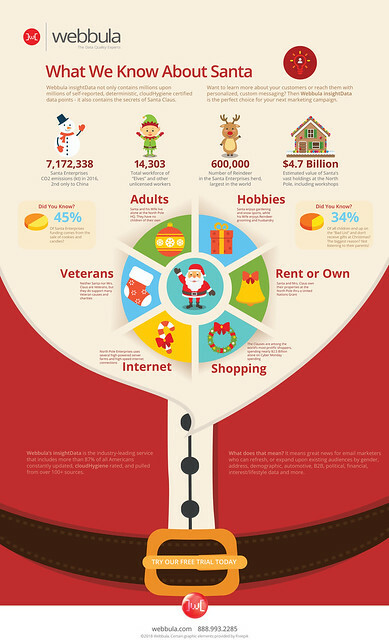 Information that you can use to better target your marketing message to them anytime of year. Check out more information about it here on our website, or give one of our friendly and helpful elves a call to talk about your needs today. And, if you happen to want to market to Santa Enterprises, just let us know. Although we must warn you Santa doesn’t answer his email.